This is a review of Carolina Brewery's Flagship IPA, not to be confused with The Carolina Brewing Company, which I have ragged on two out of three times. Unlike beers from the CBC, the Flagship IPA from the CB is quite delicious and will receive a high score in this review. It even comes in growlers! Rarrrr!! The Carolina Brewery runs two brewpubs in the Piedmont (central NC for you out-of-staters), one in Chapel Hill and one in Pittsboro (Pittsboro is also home to a combination KFC-Taco Bell). They brew a ton of beers, and this is the first one that I have had, but am interested in the others, including their Super Saaz Imperial Pilsner and their own Barley Wine. Would a trip to one of their brewpubs be worth your while? From several not-very-credible sources I can say that the food at the brewpubs is not that great, but the beer is. So if you are gonna pound a few pints before your burger arrives, you'll be just fine most likely. But if you are going their just for the food and not the beer, then what the f*** is wrong with you?! Who goes to a brewpub and doesn't drink beer? Wanker. I love the fact that Carolina Brewery sells their beer in growlers. Not heard of a growler before you say? Well, according to a very-credible source, growlers are glass half-gallon jugs used to transport beer in Australia, Canada, and the good ol' USofA. According to another uber-credible source, the term "growler" likely dates back to the 19th century, when beer was transported in buckets lined with lard (yummmmm). The sound of the CO2 escaping the lid when the beer inside sloshed around supposedly sounded like an animal growling. I don't know about you, but I think we need more bottles, jugs, containers, etc, named after animal sounds. What if we started calling six-packs "snarlers," 40s "roarers," and cases "moo-ers." How awesome does it sound when you say "I'm going to the store for a snarler of PBR, anyone need anything?" C'mon ILTS Nation, let's start a revolution in beer slang - snarlers it is. The Flagship IPA, like I mentioned above, is quite a delicious beer. Upon opening the cap, a rich aroma of hops and fruits barrage your senses, and a similar taste follows. The taste is not too bitter, but very hoppy (even my beautiful wife liked this one, and she usually is not a fan at all of IPAs). There is some slight fruit taste to it as well. The aftertaste is a little strong, and lingers for quite a while, but its not totally a bad thing, like the dude who wants to hang out at your place long long long after the party ends. At 5.7% ABV, it packs quite the punch. Oh yea, and this is one heavy IPA. I only finished half of the growler before I started bitching about being too full (go ahead and screw the cap back on and enjoy some the day after, as this beer tastes just as good after being open for 24 hours - as long as you remember to stick it back in the fridge, you dummy). At 5.7% ABV, this beer packs a quiet wallop. I picked up this growler for the amazing low price of $7.99 at the local co-op (normally priced $8.99). There is a $4 deposit though, so as long as you aren't lazy, you'll get that $4 back the next time you go to buy beer (which should be a few hours after you bought the first one if you are doing things right). 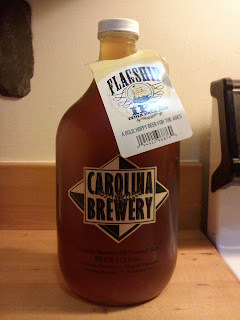 Overall, its my pleasure to recommend this beer as well as to try the other offerings from Carolina Brewery. I'm thinking that if I go through enough of their growlers, and then return them all at once, I should have enough money for a pre-owned Wii (I saw 'em at the mall yesterday for only $99, holy hell!). Or lots more beer. i sort of knew that the lazy picture was going to be of me. I think we should hold back on all the Nick Nolte references for a day or two also. hey guys, love the blog, says a fellow Western Pennsylvanian. I tried an IPA the other day here in Carrboro, NC, called Green Flash (I think), from San Diego. Super good. Very hoppy and earthy, like dirt, how an IPA should taste. Try it and review it! Glad you like the blog Mike. I know Green Flash well as I lived in San Diego for 6 years. If you are looking for a great San Diego Brewery, check of Ballast Point. They make a handful of brews, including a fine IPA themselves, but their Yellowtail Pale Ale is by far the best I've ever tasted!